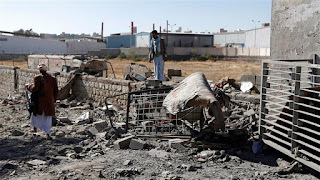 Security sources, speaking on condition of anonymity, said on Sunday that the camp was allegedly run by fighters of the Houthi Ansarullah movement, which is in the forefront of fighting against the invading Saudi war machine during the past nearly three years. On Wednesday, Saudi fighter jets also killed a woman and a girl and wounded 10 others after they hit the Mabyan district of the province with a number of airstrikes. A few hours earlier in the day, Saudi warplanes also killed 26 people after they targeted at a hotel and an adjoining market in the northern province of Sa’ada. Moreover, at least 23 Yemenis were killed on Friday in Saudi aerial attacks against Sha’ban district and Bani Ma’adh district in Sa’ada. The developments came after Yemen’s ex-President Ali Abdullah Saleh was killed on Monday while attempting to escape the capital Sana’a to Ma’arab Province. This came shortly after he broke ranks with Houthis in favor of the Saudi-led coalition. The crippling blockade has exerted further pressure on Yemeni people, who receive desperately needed humanitarian assistance through the western port city of Hudaydah and an international airport in the capital Sana’a, both under the tight siege. The UN has already made a plea for the so-called coalition to remove its blockade, warning that without aid shipments “untold thousands of innocent victims, among them many children, will die” and that its partial lifting was not enough. The Saudi-led military campaign, propelled by a constant flow of US and UK arms supplies, has been incessantly pounding Yemen since March 2015 in an attempt to crush the popular Houthi Ansarullah movement and reinstate the former president, Abd Rabbuh Mansur Hadi, a staunch ally of the regime in Riyadh. According to the World Health Organization figures, around 960,000 suspected cases of cholera and 2,219 deaths have been documented since the deadly epidemic broke out in April in the impoverished country, where 8 million people also face war-triggered famine.